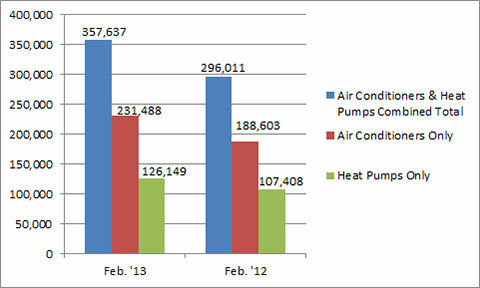 U.S. shipments of residential gas storage water heaters for February 2013 increased 8.2 percent, to 345,853 units, up from 319,516 units shipped in February 2012. 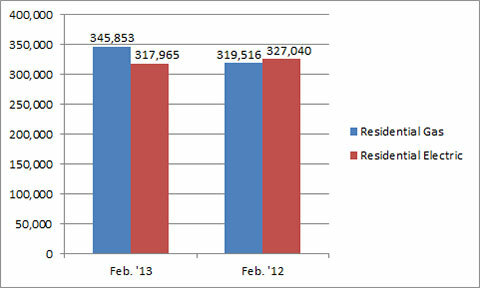 Residential electric storage water heater shipments decreased 2.8 percent in February 2013, to 317,965 units, down from 327,040 units shipped in February 2012. For the year-to-date, U.S. shipments of residential gas storage water heaters increased 9.5 percent, to 708,857, compared to 647,638 units shipped during the same period in 2012. Residential electric storage water heater shipments increased 3.7 percent year-to-date, to 655,076 units, compared to 631,569 units shipped during the same period in 2012. 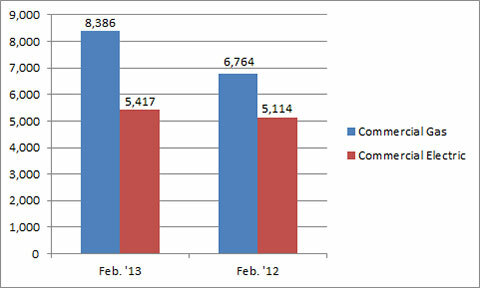 Commercial gas storage water heater shipments increased 24 percent in February 2013, to 8,386 units, up from 6,764 units shipped in February 2012. 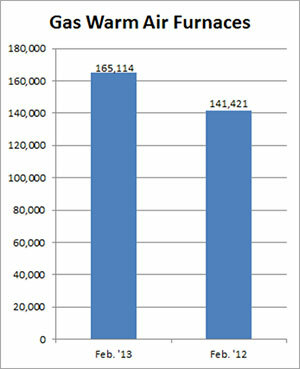 Commercial electric storage water heater shipments increased 5.9 percent in February 2013, to 5,417 units, up from 5,144 units shipped in February 2012. Year-to-date U.S. shipments of commercial gas storage water heaters increased 29.2 percent, to 16,668 units, compared with 12,897 units shipped during the same period in 2012. Year-to-date commercial electric storage water heater shipments increased 9.3 percent to 10,666 units, up from 9,755 units shipped during the same period in 2012. 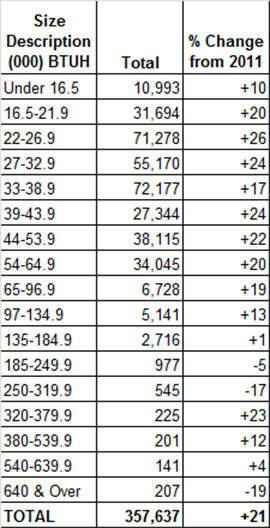 U.S. shipments of gas warm air furnaces for February 2013 increased 16.8 percent, to 165,114 units, up from 141,421 units shipped in February 2012. 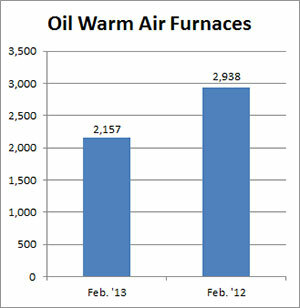 Oil warm air furnace shipments decreased 26.6 percent, to 2,157 units in February 2013, down from 2,938 units shipped in February 2012. Year-to-date U.S. shipments of gas warm air furnaces increased 25.8 percent, to 342,239 units, compared with 272,019 units shipped during the same period in 2012. Year-to-date U.S. shipments of oil warm air furnaces decreased 13.7 percent to 5,055, compared with 5,855 units shipped during the same period in 2012. U.S. shipments of central air conditioners and air-source heat pumps totaled 357,637 units in February 2013, up 20.8 percent from 296,011 units shipped in February 2012. U.S. shipments of air conditioners increased 22.7 percent, to 231,488 units, up from 188,603 units shipped in February 2012. U.S. shipments of air-source heat pumps increased 17.4 percent, to 126,149 units, up from 107,408 units shipped in February 2012.